This brief talk will discuss two related aspects of the problem of "forming explicit relations between practice and outcome and reflexively exploring the role of the researcher in producing the creative output" (CfP). To the extent that art theory emerges out of art practice, the theorisation of art practice is itself part of the practice. Or in other words, creative practice is the site of an exchange between theory and practice and between the textual and the visible, and this has implications for how proposals for practice-led research might be written and determined. Theorisation of the intention behind such research ('aims and objectives') cannot simply be a matter of setting up and justifying a prior and internal 'intention' to be externalised and expressed as 'outcome'. Nor can the question be settled by a 'reflection' the other side of intention. Rather, sense has to be made of how the theory/practice distinction is given not in advance but in practice, and how art practice is always a break with determinism and causality rather than an outcome of these, and how intention is as much an outcome as the outcome intended. Dr Jonathan Lahey Dronsfield is on the Executive Committee of the Forum for European Philosophy, for whom he chairs public events on art; Advisory Editor of Art&Research, where he has recently written on what it is for PhD students in art to write; contributor to the just published Continuum Companion to Continental Philosophy, on 'Philosophies of art; author of Cryptochromism; and writing books on Derrida and the Visual, and Art's Resistance to Ethics. Reflecting upon 30 years of practice as an artist, curator and advocate, Mike Stubbs will discuss influential works and trace connections and motivations. Exploring the relationship between personal experiences in relation to broader socio-cultural global experiences. From the micro to the macro, Media Art has engaged with the potential of people to voice their own lived experience. Stubbs asks what motivates you, what motivates change and how can we convert these drivers into forces that impact upon social change and development. 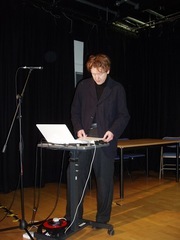 Mike Stubbs is Director and Chief Executive of FACT (Foundation for Art and Creative Technology), Britain’s Centre for Media and Digital Art. Jointly appointed by Liverpool John Moores University, he is Professor of Art, Media and Curating. Encompassing a broad range of arts and media practice his arts management, curating and artwork has been internationally acknowledged. Trained at Cardiff Art College and the Royal College of Art, Stubbs' own artwork encompasses films for broadcast, media installations for galleries and large scale projections for public environs. Much of this has been through a process of interdisciplinary research and collaboration.